The challenge was to create a universal, light, small, wooden hangboard suitable for taking it for traveling and everyday life. And we did it. Now you can continue your training everywhere and carry your fingerboard with you without noticing it. We added as many features as possible to fulfill most of the exercising facilities. There are 12 types of crimps, adjustable-angle slopers and 2 styles of pinches, as well as anatomically correct pull-up grips. ★ DESIGNED BY CLIMBERS for climbers. The most advanced portable hangboard on the market. It's universal, light, small, and wooden. ★ VERSATILE - A universal training tool. There are 12 types of crimps, adjustable-angle slopers and 2 styles of pinches, as well as anatomically correct pull-up grips. ★ PORTABLE - There is no need for a special place to exercise, any bar or branch will do. Hang the adjustable rope almost anywhere to create a comfortable training gym. 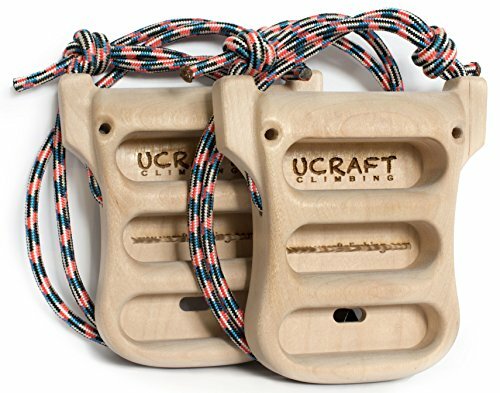 ★ SMALL AND LIGHT - This pair of hangboards weigh just over 12 OZ or 350 gms (appr. One can of cola). The product was developed to be as light and small as possible to reduce weight and bulk while traveling. Allowing the user to continue training almost anywhere. ★ WOODEN - Why is wood the best material for hangboards? It's gentle on your skin, natural, absorbs sweat, doesn't get slippery, it's light and durable. If you have any questions about this product by Ucraft, contact us by completing and submitting the form below. If you are looking for a specif part number, please include it with your message.